During the late eighteenth and early nineteenth centuries, Salem began the prosperous business of world trade. During this time they traded in China, Europe and East and West Indies ports. In these lessons children will learn what life was like for sailors as they traveled to foreign ports, some of the goods that were traded, and they will take a close look at the tea trade. Within this study the children will observe, discuss, and interpret paintings about Salem voyages, China tea trade and read text about trade, interpret information from tables, and locate trade destination on maps and globes. Artist Not Identified. The China Tea Trade, 1790-1800. Oil on canvas. Peabody Essex Museum. Online at: www.pem.org [viewed 5 August 2005]. Youqua. Whampoa Anchorage, ca. 1850. Oil on canvas. Peabody Essex Museum. Online at: www.pem.org [viewed 5 August 2005]. Ropes, George. Crowninshield’s Wharf, 1806. Oil on canvas. Peabody Essex Museum. Ropes, George. The Ship 'Friendship' Homeward Bound, 1805. Oil on canvas. Peabody Essex Museum. How was Salem involved in world trade in the late 18th and early 19th centuries? What was life like for the Salem sailors on the merchant ships? What were some of the ports the merchant ships visited? What goods were traded? What were the trade routes? Students will describe how Salem was involved in trade during the late 18th and early 19th centuries. Students will describe what life was like on board a Salem vessel sailing to a foreign port. Students will tell what some of the ports were that the Salem vessels sailed to. Students will list some of the goods traded during this period. Students will observe, discuss, and interpret paintings for their social and historical significance. Students will read historical information to broaden their understanding of a topic. Students will interpret information from a table. Students will locate destinations on maps and globes. 5:11: Explain the importance of maritime commerce in the development of the economy of colonial Massachusetts, using historical societies and museums as needed. C. Explain the importance of the China trade and the whaling industry to 19th century New England, and give examples of imports from China. Ex-privateers saw the trading potential of Eastern goods they confiscated during the war. These ex-privateers knew Salem needed to look to distant ports to truly regain prosperity. Derby’s ship, the Grand Turk, commanded by Ebenezer West, was the first New England ship to arrive in China. Making a profit was difficult in China. There were many regulations and ancient customs that needed to be dealt with before a transaction could be made. Though trading was complex and time consuming in China, the cargo the Grand Turk returned with brought Derby a profit of between 100 and 200 percent. It was not long before other merchants sent ships to China. Trade in China did not last for Salem merchants. By 1790 Salem merchants only averaged one trip per year. After a while the profit was not great enough to justify the cost and risk to ships. 1. National Park Service, SALEM: Maritime Salem in the Age of Sail. (Washington DC: US Department of the Interior): 41. 2. Brandon Marie Miller,“Salem and the East Indies”, Cobblestone, The History Magazine for Young People. 9 No. 9. ( September 1988): 6. 3. National Park Service: 42. 4. National Park Service: 42. 5. National Park Service: 43. 6. National Park Service: 43. 7. National Park Service: 47. 8. National Park Service: 109. 9. National Park Service: 17. 10. Dorothy Schurman Hawes, To the Farthest Gulf: The Story of the American China Trade. (Ipswich, MA:Ipswich Press, 1990): 50. 11. Doug Stewart,“Salem Sets Sail” Smithsonian (June, 2004): 98. Duda, Abaigeal. “Salem's Friendship" and "Life on Board" Calliope: When Spice Ruled. 16 No. 6 (February 2006): 42-3, 47. Ropes, George. The Launching of the Ship Fame, 1802. Oil on canvas. Peabody Essex Museum. Online at: www.pem.org [viewed 5 August 2005]. Moore, Michael. Table 1 & 2. Destinations: American goods Exported from Salem, 2nd Quarter, 1803. National Archives, Northeast Region. Moore, Michael. Table 3. 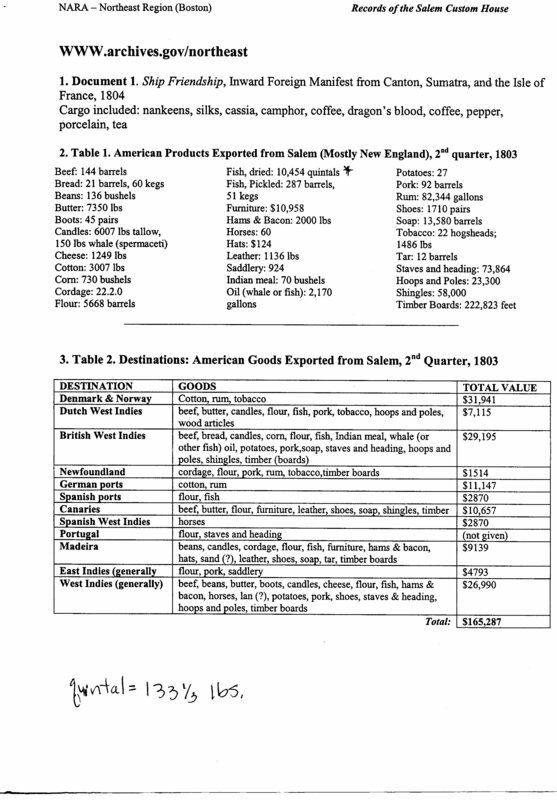 Types of Goods and Their Origins Imported from the West Indies to Salem in 1803. National Archives, Northeast Region. Moore, Michael. Table 4 & 5. 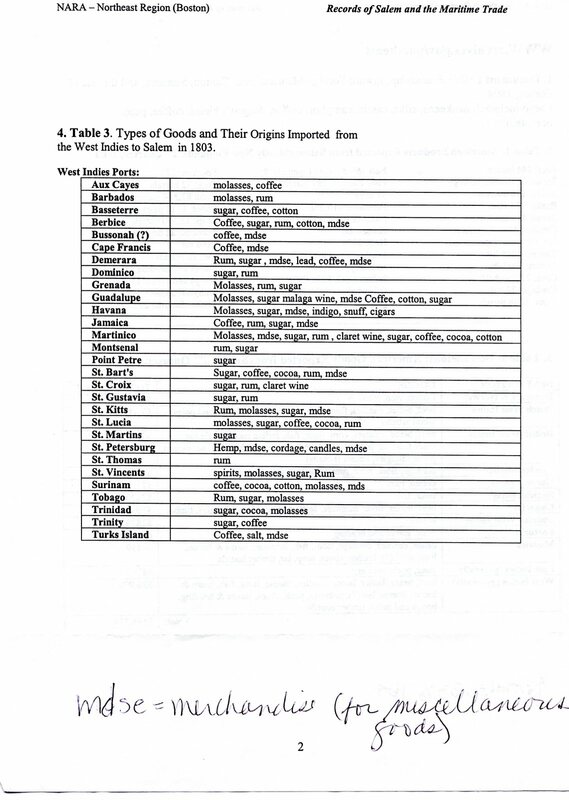 Types of Goods and Their Origins Imported from China and the East Indies to Salem in 1803. National Archives, Northeast Region. Moore, Michael. Table 6. Goods Imported from Europe to Salem in 1803. National Archives, Northeast Region. The first lesson asks the students to view the painting The Launching of the Ship Fame, 1802. After the children observe the painting and discuss it, they will read about another merchant vessel, the Friendship (text taken from Calliope, February 2006. Read with the children the following sections of that publication: "About the Friendship of Salem," and "Life on Board"). Following the reading, the children will discuss what they learned in the readings. Goals: Children will observe, discuss and describe the painting The Launching of the Ship Fame, 1802. After reading about the Friendship, children will have a better understanding of sea voyages during Salem’s "great age of trade." This painting depicts the Fame getting ready to leave Salem Harbor on a trading voyage. What is happening in this painting? What are some words to describe the people on the shore? On the ship? Is there a feeling of national pride in this picture? Why? or Why not? (Read the title of the painting to the children.) Where could this ship be going? What could it be carrying? What do you think is in the large barrels? Once the children have finished discussing the painting, explain that the Friendship was another ship that set sail from Salem to trade in the East Indies, China, and other ports. Then have them read the information about the Friendship from the Calliope articles. Before the children begin reading, introduce the following vocabulary words: mast, profit, voyage, documented voyage, privateer, commission, merchant ship, unpredictable, encountered. Guiding Questions: What countries did the Friendship visit? Explain what a privateer vessel was? Describe what life was like on board the Friendship for the crew. What happened to the Friendship in 1812? Why did this happen? We learn about the sea voyages from Salem from the painting and the text we read. Compare and contrast the information from both. During the second lesson, the children will observe and discuss paintings that depict China trade. This lesson may be done in class by accessing paintings from http://www.pem.org (go to artscape) or looking at the paintings on a field trip to the Peabody Essex Museum in Salem, MA. Goal: Children will observe, discuss and describe the paintings depicting the China trade. Painting One: The China Tea Trade, 1790-1800. This painting depicts the tea business in China. It takes the viewer from the planting of the tea crop to the ships leaving port to take the tea out of China. Explain to the children that the large ships did not come right into port. The tea was put onto smaller vessels called sampans and brought out to the larger trading ships. You may want to write on sentence strips the scenes from this painting that the children describe. At a later time, have the children put the sentence strips in order and display them on a bulletin board. If you are at the museum, ask the children to turn around and look at the painting facing China Tea Trade. Table 4. 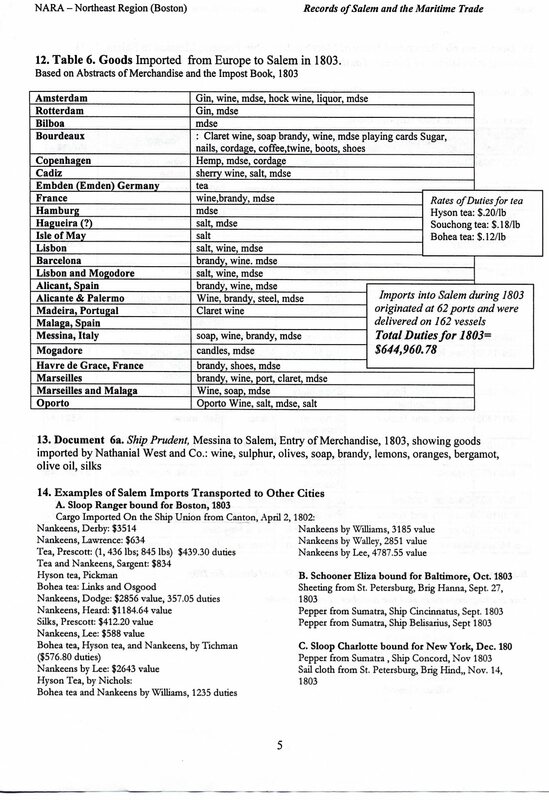 Types of Goods and Their Origins Imported from China and the East Indies to Salem in 1803. Table 6. Goods Imported from Europe to Salem in 1803. In small groups children will find information in the tables and discuss the following guiding questions: What goods did Americans export? What countries did they export these goods to? What goods did Americans import? From which countries did they import these goods? Have each group of children make charts showing the kinds of goods that were imported and exported. As a class have the children brainstorm ways of categorizing the goods. You may need to teach them to keep the categories general. You may want to give them an example of categorizing exported goods as goods made from wood, vegetables, grains, meat foods and products, and other goods. After looking at the tables and making their charts, each child in the group will pick five or more destinations and locate these destinations on a map or globe. They will write the name of the place they are locating and the lines of latitude and longitude for each place. Have the children place this information on a chart. Students will look at the paintings Friendship Homeward Bound and Crowninshield's Wharf. They will be given a set of guiding questions and asked to write about what these paintings teaches us about Salem in the age of trade. They will also be asked to draw on information learned in the first three lessons. Students may need vocabulary presented prior to lesson. Students will work with a teacher or peer tutor when doing Lesson Three. Students may use a computer for written assignment. Students can scribe information to a teacher. Student may be given a list of vocabulary words to assist with written assessment assignment. Ask children to view the painting Packing Porcelain for Export, ca. 1820. (Gouache on paper. Peabody Essex Museum) and discuss it. Read and discuss "Salem and the East Indies Trade" (Cobblestone, Vol. 9 no. 9, September, 1988). 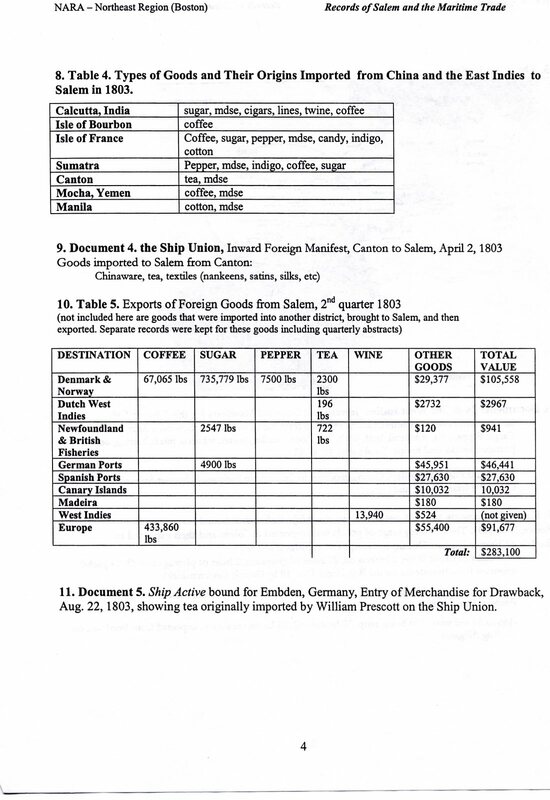 Children can use charts from Records of the Salem Custom House to compare values of different cargos exported to different ports. Children can compare values of exports and imports using tables two and five. Using the painting The Launching of the Ship Fame, 1802, ask the children to write a story from the point of view of a sailor on the ship or a merchant on the shore. Although George Ropes only lived to age thirty, he produced a number of works that portray daily scenes of life in Salem. He worked as a sign, carriage, and landscape/marinescape painter to support his family following his father’s death. Here, he has captured a wharf built by built by George Crowninshield and Sons and also several ships that they owned: the America, Fame, Prudent and Belisarius. Because merchants made money when their vessels were exchanging goods in other ports, it is unlikely that all of these vessels would have been in Salem’s port at once. 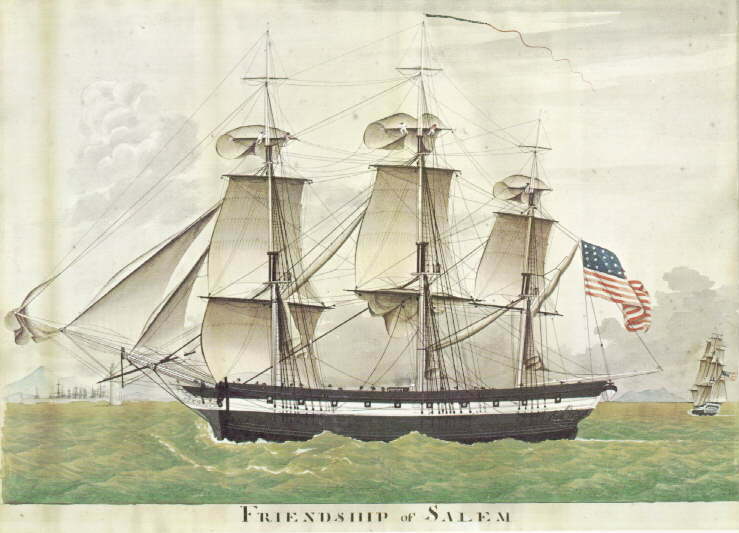 Ropes painted the Friendship as she returned to Salem. The vessel would have been heavily laden with goods from abroad. It was these goods that made Salem - and many of Salem's merchants - very wealthy during the years following the end of the Revolutionary War. Oil painting at the PEM that depicts the entire process of the tea trade. The painting takes one from preparing the soil for planting tea to the sailing vessel taking the tea out of China. This painting depicts Whampoa where tea was picked up from smaller vessels. Children view the port where ships wait for goods and a cemetery for sailors who die while in port. The next four sources are excellent examples of tables where the children can read about ports visited and goods exported and imported. These sources help them to understand China trade was a business. For more information or to contact the National Archives, Northeast Region, see their website: www.archives.gov/northeast. Tables created from Records of the Salem Custom House. Distributed at SIH Summer Institute, July, 2005. Tables created from Records of Salem and the Maritime Trade. Distributed at SIH Summer Institute, July, 2005. Ropes, George. The Launching of the Ship 'Fame,' 1802. Oil on canvas. Peabody Essex Museum. Online at: www.pem.org [viewed 5 August 2005]. Oil painting at the PEM that depicts the excitement and national pride as people on the dock arrive to see the ship Fame off on a trading voyage. The articles used in this lesson give the children interesting historical information and help them to understand what life was like for sailors. There is also a fascinating section on a ships log ("Plotting Firendship's Course). Teachers may wish to do extended lessons with this information. Hawes, Dorothy Schurman. To the Farthest Gulf: The Story of the American China Trade. Ipswich, MA: Ipswich Press, 1990. Excellent source for background information. Miller, Brandon Marie. “Salem and the East Indies,”Cobblestone: Salem and the East Indies Trade 9 No. 9. (September 1988). Excellent source for background information. Written for children to read and understand. National Park Service. SALEM: Maritime Salem in the Age of Sail. Washington DC: US Department of the Interior, 2002. Excellent source for background information. It also includes maps, paintings of men involved in the China trade and some sea paintings. Stewart, Doug. “Salem Sets Sail.” Smithsonian (June, 2004): 92-99. This article overviews Salem's participation in Martime trade and also overviews some of the goods that were brought back from China and the East Indies. Yoder, Carolyn, P.,editor. Cobblestone: Salem and the East Indies Trade 9 No. 9 (September 1988).